As the classic story is revived for new film and stage versions, directors must confront the problems in Rudyard Kipling's original and Disney's 1967 movie. Mowgli, the man cub of The Jungle Book, has two daddies, and despite appearances, they're not Bagheera the panther and Baloo the bear. Rudyard Kipling, who came up with the story of the orphaned Indian boy, and Walt Disney, whose studio has made an inflation-adjusted gross in excess of $500 million on its original $4 million investment in Kipling's tale, had contrasting creative agendas that are still generating controversies as The Jungle Book roars back to stage and screens in three separate new incarnations. Having followed the success of the original 1967 Jungle Book film with at least one live-action remake, a direct-to-video animated sequel, plus the video games, pajamas, Pez dispensers, and Happy Meal toys that go with inevitable and lucrative product licensing, Disney is now backing two simultaneous Jungle Book projects. Justin Marks, writer of the time-traveling-meets-terrorism TV movie Rewind and the screenplay for the girl-seeking-vengeance action flick Street Fighter: The Legend of Chun-Li, has been signed to write a live-action version. Tony-winning and MacArthur "genius grant" director Mary Zimmerman has re-conceived and directed a new Jungle Book musical co-produced by the Goodman Theatre in Chicago and the Huntington Theatre in Boston, where the show is running through October 20. Across town, Warner Brothers has brought in Steve Kloves of the Harry Potter franchise to write, direct and produce a different live-action Jungle Book. Disney regularly recycles its properties, strategically releasing anniversary DVDs and most recently having raised a billion dollars worldwide with the live-action version of Alice in Wonderland directed by Tim Burton. In coming years we can expect to see a a number of live-action takes on old favorites, including a prequel to Sleeping Beauty tentatively titled Maleficent (starring Angelina Jolie) as well as Beauty and the Beast (reportedly produced by Guillermo del Toro and starring Emma Watson) and a new Cinderella (featuring Lily James, Cate Blanchett and Helena Bonham Carter directed by Kenneth Branagh). And with Lion King now the highest-grossing musical in Broadway history, the company increasingly tests the market with theatrical versions of its features, managed by its Disney Theatricals division. But only some of Jungle Book's resurgence can be attributed to Disney (and Warner Brothers) banking on family entertainment with built-in name recognition. Unlike more conventional fairy tales, the Jungle Book with its exotic locale and tale of a child learning where he really belongs seems ready-made for young families that value multiculturalism and globalism in their entertainment. But that, as it turns out, is the source of the trouble. Staging Kipling in 2013 isn't the same task as it was in 1962 when Disney first tackled it, or in 1942 when the Korda brothers filmed their resonant version. Joseph Rudyard Kipling, an Englishman born in 1865 in Mumbai, was an unrepentant defender of empire who coined the ignominious phrase "the white man's burden" in an 1899 issue of McClure’s Magazine where he urged the United States to colonize the Philippines. (Memorably, George Orwell condemned him as a "prophet of British imperialism".) The Walt Disney studio of the mid-1960s seemed to have been oblivious to the idea that anyone would take offense at the character of King Louie, a jive-talking orangutan who sang to Mowgli about "want[ing] to be like you." New Jungle Book adapters can't claim the same obliviousness; they must contend with the legacy of British colonialism, American racism, and contemporary identity politics against the backdrop of a multimillion dollar brand. Zimmerman was faced with the trickiness of these issues while her adaptation was still in pre-production. As the show was beginning technical rehearsals, Chicago Magazine writer Catey Sullivan asked Zimmerman about how she was planning to address Jungle Book's problematic legacy. "Kipling’s politics are pretty terrible and pretty undeniable," the director said. "Having been in India I realize most of the stuff we know about India is from books written by Westerners. But you go over there and you see that the British occupation was so short in the history of the country. No one is sitting around moping about the raj. You have to remember the past, but you don’t have to live in it." Then Zimmerman, defending Disney characterization of King Louie, noted, "it’s something I think where the racism is in the eye of the beholder, you know?" Outcry erupted. Jamil Khoury, Founding Artistic Director of the Chicago theatrical troupe Silk Road Rising, called her out on what he described as "her reckless, unexamined Orientalism." One online commenter argued that "there are too many white people in general in this industry who dictate creative decision making and are quite reckless when it comes to responsibly portraying the cultures of others that are not their own." Eventually, responding by email to Khoury, Zimmerman addressed the complaints. "The phrase 'Racism is in the eye of the beholder' is completely preposterous and I disavow it," she wrote. "Here is what happened: We were talking about the Disney film and King Louie, an orangutan. She asked me about this character and how he has been sometimes named as a "racist character" which many people believe was voiced by Louis Armstrong, but was in fact conceived for and voiced by Louis Prima, a white Italian American. I challenged the assumption that King Louie is a derogatory depiction of a black man given that what is on the screen is only an ape, drawn in a style consistent with all Disney animation of the period, voiced by a white musician, singing to a little Indian boy...It is more accurate to say that the ‘race’ of the animated King Louis is in the eye of the beholder..."
On stage, Zimmerman has handled the tricky material well. The exoticism of the story no longer seems derived from racial or imperialist undercurrents but rather from the fantasy of the tale itself: This is a world where human children become best friends with talking animals. While Zimmerman hews to the cheery, character-driven Disney narrative that streamlines Kipling's episodic plot, she has given some of the jungle's animals back stories and reinforced the significance of their quest for the "red flower," fire. Andre De Shields (The Wiz, The Full Monty) plays the aging wolf pack leader Akela, and his watchful gravitas in that role leavens any discomfort an audience might have as he returns as King Louie, long dreadlocks swinging like a zoological Bobby McFerrin while flowers and teacups fly through the air. The show's jungle is also more culturally and geographically rooted than the animated version's was. Zimmerman and her long-time team of collaborators used some of Disney's money for research trips to India, and this Jungle Book is drenched in Indian-inspired details. Music director Doug Peck adds splashes of curry to Disney's New Orleans gumbo, rescoring Terry Gilkyson’s "Bare Necessities" and Richard and Robert Sherman's "I Wanna Be Like You" and "Trust in Me" for a 12-piece combo that includes Chicago jazz musicians and classical Indian instrumentalists playing sitar, carnatic violin, and a variety of authentic percussion instruments. The set by Dan Ostling and costumes by Mara Blumenfeld, opulent by regional-theater standards, offer a riot of saturated turquoise and coral paisleys, florals and tiger stripes with the distinctive silhouettes of raj-period costume: sherwani and turbans, military uniforms and pith helmets. With a multicultural cast and the introduction of substantive female characters including of a peacock, a mother wolf, and butterflies, Zimmerman counterbalances the Disney animation's nearly all-male dramatis personae. The upcoming Kloves and Marks live-action versions may take on Jungle Book's darker, more violent aspects where the Indian jungle is not so much a world of bright vines and flowers. Disney and Warner executives will surely be keeping their eyes open for incipient controversy. But for Mary Zimmerman, "The Jungle Book isn’t an Indian world, or an English world, or an American one. It’s a world of imagination—a paradise you’re going to lose." 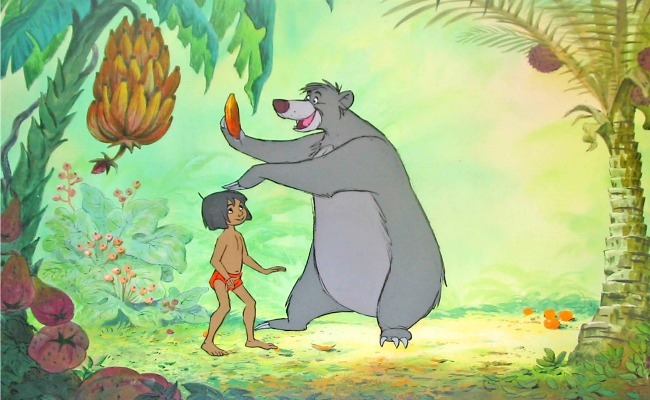 There may be plenty of reasons to take offense at Kipling or Disney or both, but at least in its current musical incarnation, Jungle Book can be a story about belonging to chosen families, of loving whom you love, and ultimately, showing what happens when someone makes imagination a place to call home. Debra Cash is a writer for Artsfuse.org and a scholar in residence at the Bates Dance Festival.